For three decades, newspapers have experienced a declining readership among young people. Scarborough Research, which measures lifestyle and demographic attributes of American consumers, reported in 1967 that 73 percent of 25- to 34-year-olds regularly read a newspaper. By 2001, that number had fallen to 40 percent. Enter a wave of free tabloid papers, many of them owned by flagship dailies, handed out to commuters in cities around the world. Easy to read on a train or bus, and packed with bits of information and colorful graphics, some see these publications as a way to entice younger readers back to newspaper reading. Among those helping to establish this new model for print media is Kellogg School alum Laura Gordon '90, who had less than two weeks to prepare for her role as publisher of Quick, a sister publication to the Dallas Morning News. 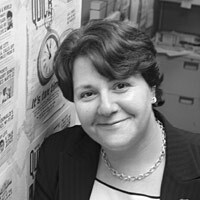 Gordon had spent plenty of time focusing on 18- to 34-year-old readers in her position as managing director of new product development at the Morning News, and she had a wealth of experience in understanding customer’s needs through earlier brand management, marketing and product development work at Helene Curtis. But little could have prepared her for the 12-day launch of the aptly named Quick, put on the fast track when the Morning News learned in October 2003 that a competitor had plans to launch a similar product. “We decided there was a first-mover advantage and we needed to enter the market quickly,” says Gordon. Gordon and her new staff, who she was asked to lead for an indeterminate period, had to work out the publication’s design and all the back-end processes. “There was an amazing exhilaration to watch the publication come off the presses for the first time,” says Gordon, whose “quick” work was rewarded in an Oct. 1 promotion to senior vice president of marketing for the Morning News. In the weeks that followed, Gordon needed to earn the respect of the journalists working on the publication. Although Quick bears some resemblance to the Morning News, its mix appears decidedly different. Four paragraphs often suffice as coverage even for complex stories, while the parent paper dedicates much more ink to reporting. While some young people will want the full story, “Those people are not going to be Quick readers,” Gordon says. As for the future of newsprint, Gordon says papers will have to continue leveraging innovative strategies to gain readers. “What these products show is that the one-size-fits-all strategy is probably not going to be effective,” she predicts.